With the gift giving season fast approaching, parents can struggle to find ways to include their children in more of the giving side of holiday time. We all love the surprise and joy of a child receiving a gift, but it can be hard to make the equation less lopsided. If gift giving is part of your holiday tradition, finding meaningful ways to include children can be tricky. I remember a school store that opened just before winter break when I was in elementary school. The shelves had different knickknacks for very low prices so that kids could buy presents with only a little bit of pocket money. However, I also remember feeling nothing was the right sort of gift for my parents or siblings. With my own children, we focused on handmade things they could do themselves or do with only minimal assistance; in this, even if the result was not the “perfect gift”, it was filled with the child’s energy and love. And that was a value I definitely wanted to instill. The following is a list of things your child might like to make. The inputs tend to be inexpensive and the skill levels vary. Some of them are even quite good ideas for adults; the result would just be a bit more polished. Remember to start a little early; handmade gifts often take longer to make than you might think at the outset. Also, don’t be afraid to offer a hand if it seems like it might be welcome. 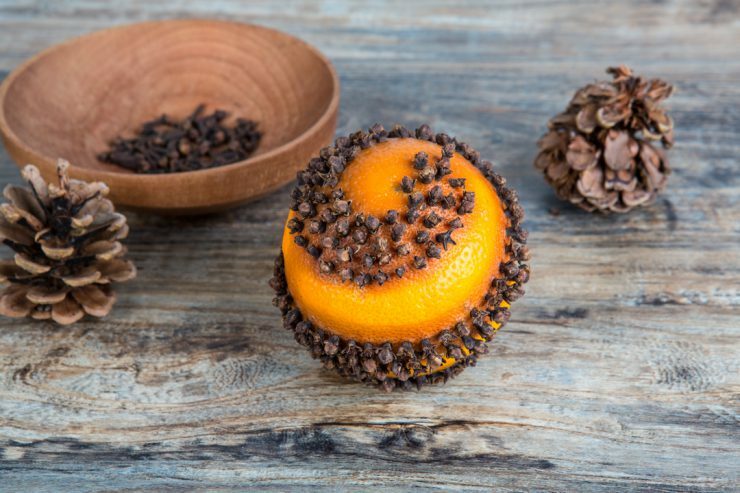 Pomander: Use whole cloves and stick them into either an orange or a grapefruit. You can use a rubberband for a guide on the fruit if you would like the rows of cloves to be straight. Some people have trouble with mold, but we always completely covered the skin with the cloves and never had any trouble. One recommendation is to hang them with a bit of ribbon for a week or so in a dark place to give the fruit time to dry out. Rose windows- These make a lovely seasonal decoration and children as young as four can do simple ones with only a little assistance. Felt Ornaments: Using a stencil or a cookie cutter, your child can make holiday shapes. By sewing two together and running a piece of narrow ribbon through the top, you’ll have a sweet homemade tree ornament. You can also add stitches to decorate the surface of the felt. Simple knitted projects: Arm a new knitter with some chunkier yarn and bigger knitting needles, and they can pretty easily crank out a scarf for a friend or family member. 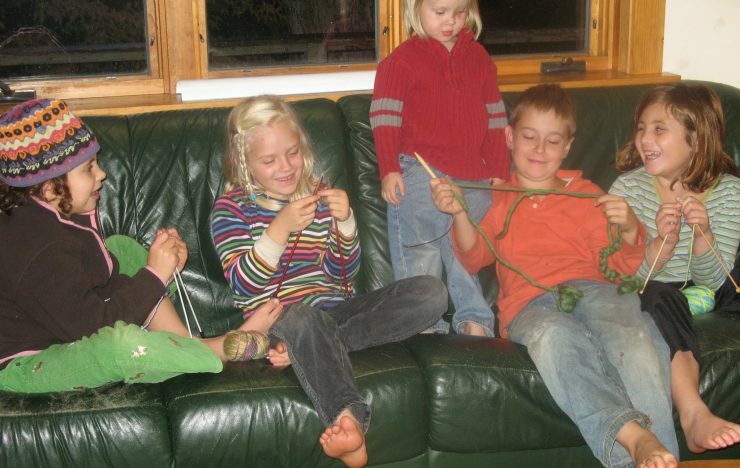 Let them choose their yarn with a little guidance from you; think color and think smooth. Self-striping yarn can add a bit of fun to a project and choosing a smoother yarn can make the knitting easier. Paint a Stepping Stone: For the color to last, using outdoor acrylic paint, also called patio paint, is the what to use. This might make the project a no-go for many, but it does make a lasting, useful item a grandparent or other family member will see often. And painting is an activity that almost any child will enjoy. Gingham cross stitch: Gingham fabric is a very fun way to learn cross stitch; my aunt calls this method chicken scratch. You use the squares on the gingham to define your stitches, so choose larger patterned gingham for a younger child. 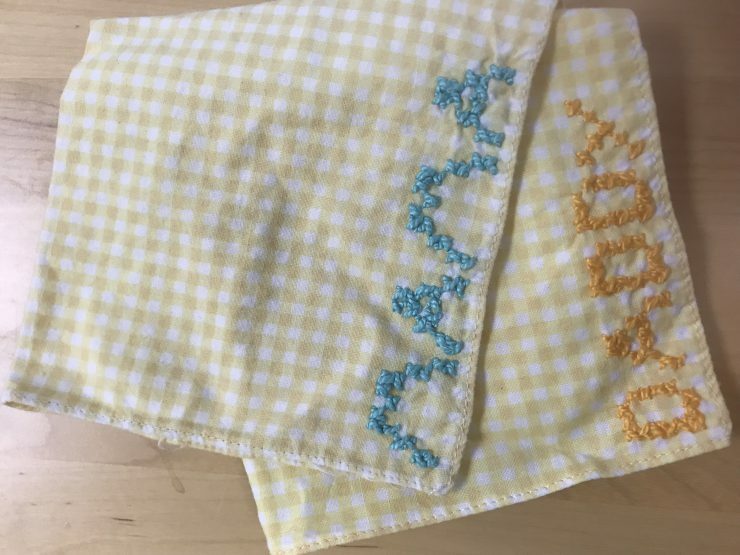 They can put initials in one corner of a hemmed square to make monogrammed handkerchiefs or they can add some accents to a gingham kitchen towel or apron. God’s Eye- These spiritual or votive objects can be so lovely. Using a variety of colors of yarn, just weave four sticks or dowels in a cross pattern. Paper Weaving- This project can be so fun and can produce very engaging pieces of art. Using old maps or photographs or magazine pages or transparency paper, choose one sheet as the background and make slits in one direction across its width without cutting the edge of the paper. Cut strips of the other paper and then weave them through the slits of the background sheet.